‘Who?’, you may ask. James Knox Polk, the 11th president of the United States, was, even during his own lifetime, somewhat unknown. His opponents in the Whig Political Party, said that the 1844 Election’s dark horse victor had emerged from a ‘well-deserved obscurity’. Informed history now views Polk, who at 49 years old in 1845 was the youngest president to take office up to that time, as one of the country’s strongest leaders, and counts among his greatest achievements the transformation of the United States into a coast-to-coast nation, with the acquisition of today’s US Southwest from Mexico as a result of the Mexican-American War and the resolution of the Oregon Country border dispute that he resolved with Great Britain, thus averting a third war between the two countries in the span of 70 years. Rain fell on Lowell, Massachusetts on the afternoon of June 30, 1847, as a special train from Boston arrived in Lowell’s Bleachery section, nearly 40 years before Sacred Heart Church would be built nearby. 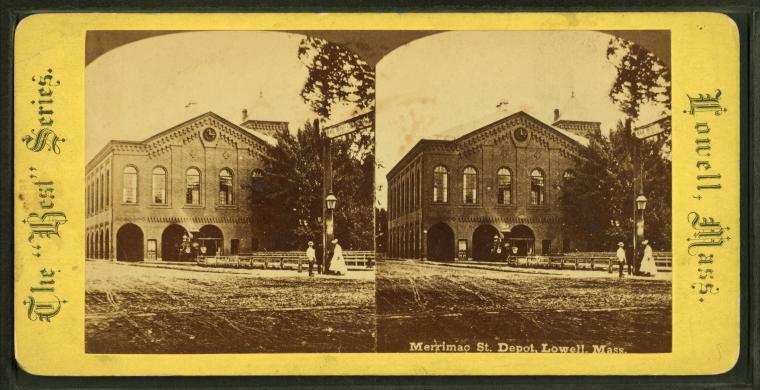 Mayor Jefferson Bancroft, Lowell’s Committee of Arrangements, and a large crowd of onlookers had assembled at the train’s ‘stopping place’ (Bleachery Depot) and welcomed President James K. Polk to Lowell. Around 3 o’clock on that afternoon, Polk and his entourage stepped from the train into what was then the city’s southern edge. Many within the crowd, numerous ‘factory girls’ from the mills among them, were seeing President Polk for the first time, and were surprised to find that he was “a better looking man than [they] expected he was”. A festive mood passed throughout the crowds as the mills and other businesses had been closed in honor of the President’s visit. Mayor Bancroft addressed the President, his traveling companions, and the crowd. His words, recorded in the next day’s Lowell Courier, provide fascinating insight into how Lowellians of the mid-19th century viewed the city’s rapid growth from a “waste” earlier in the century to its new status as a “great manufacturing city of this great nation”. Bancroft touted the city’s growing population that had reached more than 30,000 people. Mayor Bancroft, himself a former mill operative who had come to the city some 20 years earlier, recalled for the President how the ‘waste had been built up into a handsome city of mills, workshops, dwellings, and public edifices, showing better than I can tell, that the strong and muscular arm of the artisan and the muscular arm of the laboring man has not been idle here.’ Lastly, Bancroft told the story of how many of those who Polk saw and met that day had come to Lowell in its infancy, ‘poor and penniless’, and by their own hard work had been able to purchase stock in the mills where they labored, and thus had later purchased real estate within the city. 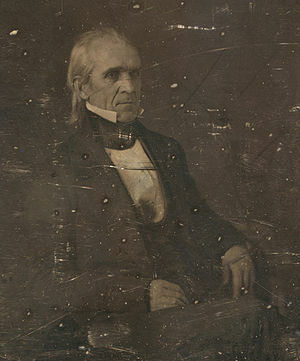 History records that President Polk replied briefly, but that no one actually heard or remembered his words – due to the ‘immense crowd’ and the noise of the cannon. Newspaper reporters, not yet equipped with modern conveniences of microphones and recorders, preserved his response for posterity as ‘ appropriate remarks’. A procession of several carriages was formed, all the principal dignitaries of the day present. The Lowell City Guards began the procession, led by then-Lieutenant Benjamin Butler and joined by other local military orders. The President’s carriage, drawn by four horses, followed. By 5:30 PM, the procession arrived at Lowell’s Merrimack House, located at the corner of Dutton and Merrimack Streets. (Merrimack House was destroyed in a 1924 fire; the site is now occupied by a Hess gas station.) Curiously, during Polk’s stay at Merrimack House, the flag hoisted upon the nearby Liberty Pole flew at half-mast, which, even during those long-ago days, was understood to be a sign of distress. The President checked into his hotel, and, at six, attended a ‘superb supper’ with Mayor Bancroft and the other dignitaries at Mechanics Hall. Polk dined and drank with the Lowell men – and later retired to his rooms at the Merrimack House for the night. 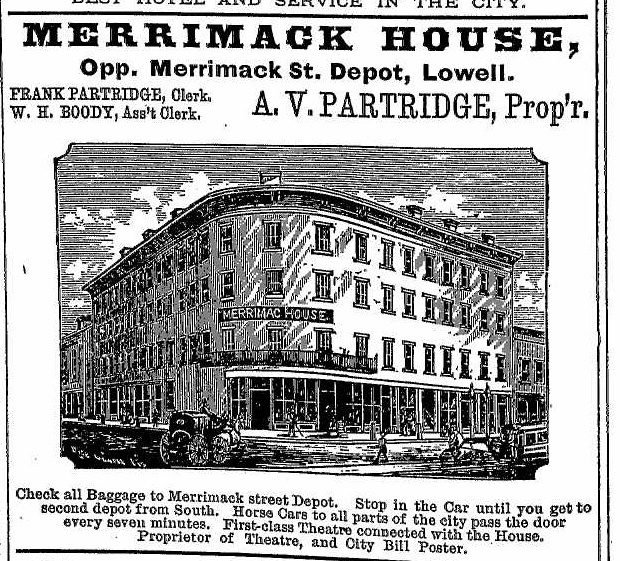 The Courier records that President Polk visited the Middlesex and Prescott Mills early on the morning of July 1, and boarded the 8 o’clock train to Concord, New Hampshire from the Merrimack Street Depot, located on the lower floor of Huntington Hall – also destroyed by fire, in 1904. Despite the early hour, a large crowd assembled to see President Polk off. As the train pulled away from the Depot, someone in the crowd called for three cheers. Instead, the crowd called “no go” as the President’s train disappeared from view. The President did return that night, to switch trains before leaving for a visit to Portland, Maine. The purpose of Polk’s visit to Lowell on that long-ago day is not actually recorded in the Courier, which isn’t really surprising. In reading through newspapers and other contemporary, locally minded media of the 19th century, national news is much less of a focus than what is found in today’s local media. The Lowell Courier does record, courtesy of the Boston Transcript, that Polk’s visit marked the third presidential visit to Boston in the past 14 years that had happened during a rainstorm. Polk’s visit to Lowell was part of a larger tour that also included stops in New York; Boston; Charlestown, Massachusetts; Portsmouth, New Hampshire; and Newburyport, Massachusetts. The reality was, in fact, that Polk undertook the tour of New York and New England to help influence the upcoming Congressional elections, which he saw as critical to the success of his policies. Most coming to see Polk on that day came to catch a glimpse of the President, a rare occurrence in a day lacking the access to celebrity we now enjoy. On a lighter (and closing) note, though, I had no idea, before researching this article, that President Polk had once slept at the site of the present-day Hess station at the corner of Merrimack and Dutton Streets in downtown Lowell. I think I would have done a double-take had I seen a sign there proclaiming that “President Polk slept here”.